(left to right) Michael Idalski, Britain Gebhardt, Annie Pfohl, Taylor Snooks, Alex Newkirk, Amanda Giles, Carissa Gonzalez, Joe Wesolowski, David Kaplinsky and Sam Button-Harrison in Underscore Theatre Company’s world premiere musical CARRIE 2: THE RAGE (An Unauthorized Musical Parody). All Photos by Evan Hanover. 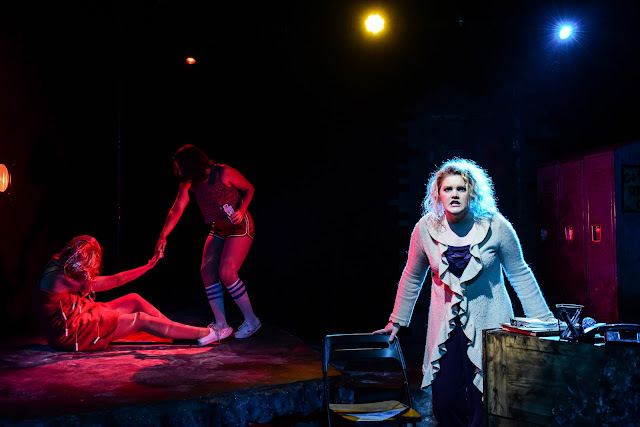 Halloween season is ripe for gory stories, and Underscore delivers, in a hidden little storefront, Arkham theatre in Uptown, named specifically for this production. Note: The Arkham was the asylum in the Carrie-verse, which is in turn named for H.P. Lovecrafts' fictional town. Don't forget to "check in" to the asylum on social media! 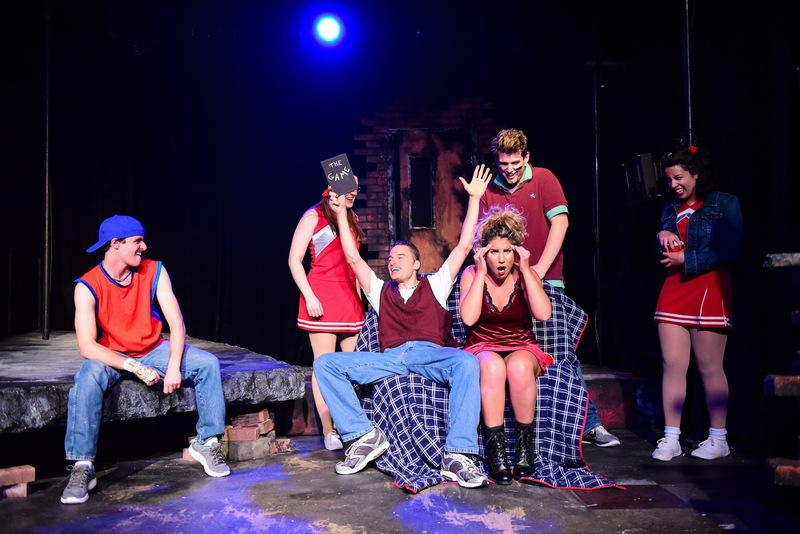 Underscore Theatre's macabre musical parody takes place 10+ years after the fateful, pig blood infused prom night, when bullied Carrie White went homicidal. 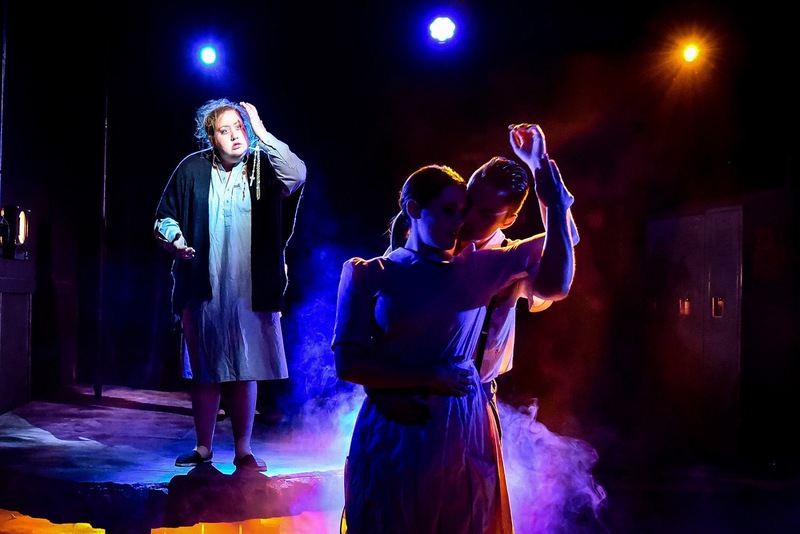 What this low budget production lacks in stage blood it more than makes up for with laugh inducing melodrama, soaring songs, and copious use of the word telekinesis. Underscore Theatre scores again with a creative, over the top parody that makes poking fun at it's subpar namesake far more fun than the original. 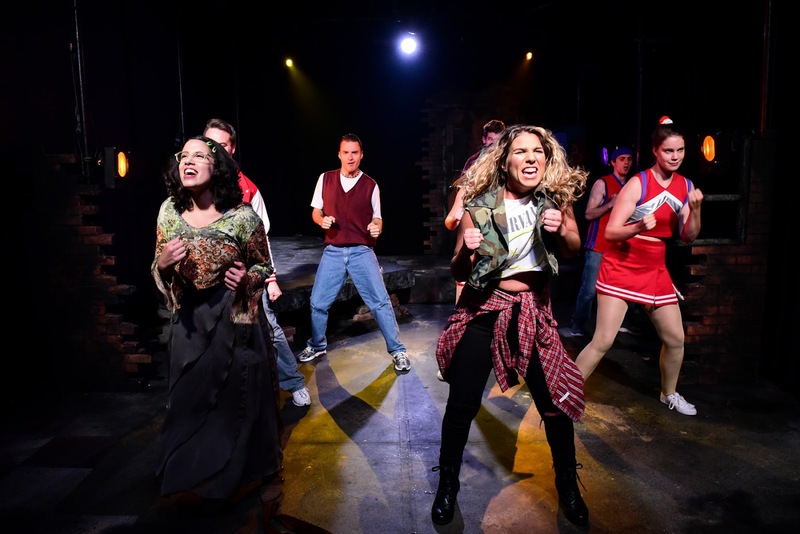 With plenty of catchy tunes, dramatic gestures, and larger than life characters, Carrie 2: The Rage (An Unauthorized Musical Parody) makes for a fun night out. We were already booked on the press preview, so we ducked in last night for their packed house, Monday show. We caught two understudies, Miki Byrne as Amy and Taylor Snooks as Lisa/Monica. The whole cast was tight and a delight to see, particularly the women. The boy band moves of the football team are a hoot, too, even as they sing about threatening with physical violence. Standouts were the traumatized guidance counselor, Sue Snell (Britain Gebhardt), the religious nut mother, Barbara (Annie Pfohl), with a tiny but mighty role and fierce vocals, mean girl supreme, Tracy (Amanda Giles), and scary Carrie's little half sister, Rachel (Demi Zaino). 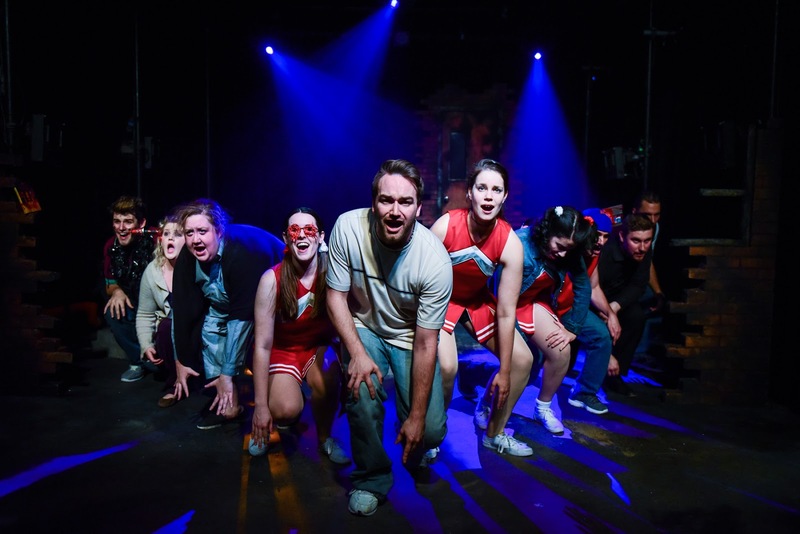 (left to right) Demi Zaino and Michael Idalski with the cast of Underscore Theatre Company’s world premiere musical CARRIE 2: THE RAGE (An Unauthorized Musical Parody). Until human beings learn to quit being so awful to each other, mean girls, rapey jocks, adults with mental issues, and vengeful teens with preternatural powers are always in season. Catch this wacky world premiere while you can. Rachel (AKA: Carrie 2) will be raging through November 19th. Back in the mid 90's, I played Carrie in a haunted house for two seasons, moving kitchen drawers and banging cupboards with my mental powers (and a little help from backstage). It was huge fun donning my deliciously bloody prom dress and air brushed makeup and scaring full grown adults into screaming idiots. I'd never made anyone pee themselves before, run shrieking into walls, or completely lose their minds. So, I'll always have a soft spot for the Carrie character. Just in time for Halloween, Underscore Theatre Company is pleased to launch its 2017-18 Season with the world premiere of with CARRIE 2: THE RAGE (An Unauthorized Musical Parody), an irreverent, rock-infused send-up of Stephen King’s iconic horror film Carrie and its subsequent spin-off The Rage: Carrie 2, featuring a book, music and lyrics by Preston Max Allen. 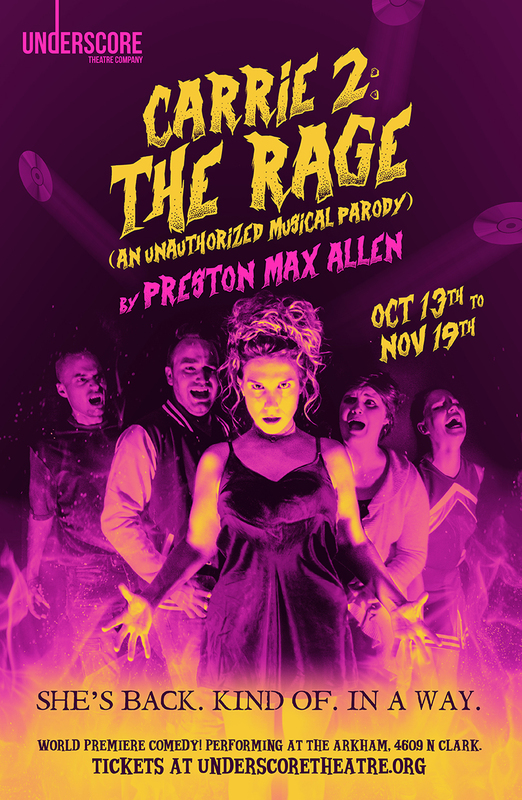 Co-directed by Isaac Loomer and Rachel Elise Johnson, with music direction by T.J. Anderson, CARRIE 2: THE RAGE will play through November 19, 2017 at The Arkham, 4609 N. Clark St. in Chicago. Tickets on sale at underscoretheatre.org. CARRIE 2: THE RAGE (An Unauthorized Musical Parody) will feature Demi Zaino as Rachel, Alex Newkirk as Jesse, Britain Gebhardt as Sue Snell and David Kaplinsky as Producer/Arnie with Sam Button-Harrison, Amanda Giles, Carissa Gonzalez, Michael Idalski, Annie Pfohl, Taylor Snooks and Joe Wesolowski. The production team for CARRIE 2: THE RAGE (An Unauthorized Musical Parody) includes: Eric Luchen (scenic design), Rachel Johnson and Isaac Loomer (costume design), Erik Barry (lighting design), Timothy McNulty (sound design), Mealah Heidenreich (props design), Andrew Lynn (production manager), Karla Meyer (sound engineer), Elias Nelson (stage manager) and Josh Prisching (technical director, master electrician). Curtain Times: Mondays, Fridays and Saturdays at 7:30 pm; Sundays at 4 pm. Please note: there will be an added Halloween performance on Tuesday, October 31 at 7:30 pm. Tickets: $20 Sundays & Mondays; $25 Fridays & Saturdays. Tickets on sale at underscoretheatre.org. Preston Max Allen (Book, Music and Lyrics) is a writer, composer, lyricist and bizarrely avid Carrie fan based in New York City. Their work has been featured at the New York Musical Festival, Musical Theatre Factory, Feinstein's/54 Below, Joe's Pub, Laurie Beechman Theatre, Signature Theatre, York Theatre ("Tune In Time" winner), Gallery Players and Second City Chicago. Preston conceived and wrote book, music and lyrics for We Are The Tigers, A New Musical (Hudson Backstage Theatre, L.A. Stage Alliance Ovation winner for Best Lyrics/Composition, nominee for Best Production and Music Direction), Remission (NYMF Developmental Reading Series), CARRIE 2: THE RAGE (An Unauthorized Musical Parody) (Feinstein's/54 Below) and My Gay Killer Husband: A Lifetime Original Musical (Boo Festival Award Winner). Additional projects include book/lyrics for Franklin Pierce: Dragon Slayer (composer Will Buck, Sound Bites 4.0 Selection), music/lyrics for Bradical and the Pink Socks (Diverging Elements), music/lyrics for The Hunted: Encore (LA Webfest Outstanding Score), book/music/lyrics for The Untitled Agent 355 Project with collaborator Jessica Kahkoska (Marion International Fellowship Recipient) and a collaboration with composer/lyricist Rob Rokicki. Preston is a graduate of the Second City Chicago Comedy Studies Program and alum of the BMI Lehman Engel Musical Theater Workshop. Isaac Loomer (Co-Director) Originally from MN, he is excited to be putting on his director hat with long time friend Rachel Johnson for the first time since moving to Chicago. 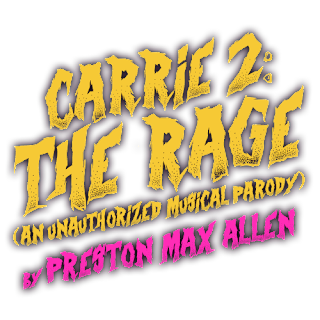 He has been obsessed with musical theatre for as far back as he can remember and is thrilled to be working on the world premiere of The Rage: Carrie 2. One of the the things that drew him to the project is a love of the famously flopped musical version of Carrie, and after reading the script to The Rage knew that it would succeed where it's predecessor had failed. It's a show that relishes in the Carrie-verse's successes and flops while still maintaining a clear relevant message for any era. Rachel Elise Johnson (Co-Director) most recently assistant directed Underscore’s world premiere of My Name is Annie King. She also serves as Underscore’s Company Manager and has been performing in the Chicago theatre community since moving here from California. T.J. Anderson (Music Director) Recent music direction credits include Shockheaded Peter (Black Button Eyes Productions), Now. Here. 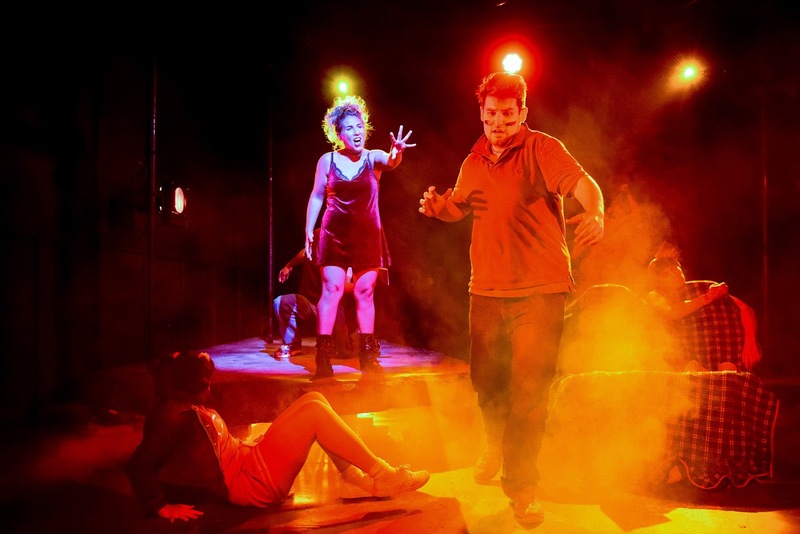 This., [title of show], A New Brain (Brown Paper Box Co.) and Borderlands (Underscore Theatre Company). He has also recently been seen onstage as an actor in productions with Brown Paper Box Co., City Lit Theater Company and 20% Theater Company. T.J. is an artistic associate with Brown Paper Box Co. and a trumpet player throughout the city.